Lane Crawford brings to the town the one-of-the-kind personalized and exclusive made-to-measure service from March 1 to 19, featuring the best in design and craftsmanship from an edit of modern and classic tailoring brands including Armani Collezioni, ISAIA, Canali and Lanvin 15 Faubourg. Like every season, the brands are sending their best master tailors to Lane Crawford to provide the impeccable MTM servicefor the discerned gentlemen in town. ISAIA’s master tailor Ms Gianluca Rubino will also be available for press interview during his stay from March 8 to 11 to share with us about the brand sophisticated sartorial craftsmanship, exquisite fabrics and updated tailoring trend. 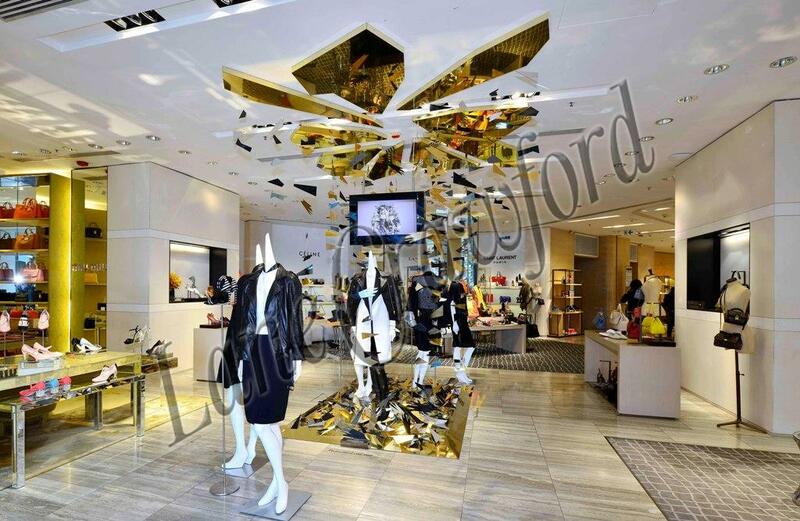 Lane Crawford's multi-brand MTM service is available at Lane Crawford ifc mall and Lane Crawford Canton Road. For interview arrangement and further information, please contact the PR team. “To step in the world of jewellery is like passing through a magic mirror", says Parisian jewellery designer Lydia Courteille. She creates her collections with her magic wand and unlimited imagination. Each of her piece tells a story with almighty uniqueness. Lydia travelled the world over, visiting mines and markets, and becoming inspired by new sensations, colours, and history. As a free-spirit, she sets her own pace, not afraid to use colours and contrasts that are vibrant and unexpected. A certified gemmologist, Lydia uses her expertise to seek out rare and precious stones, though she tends to favour those with charm and originality. Not allowing her passion for jewels to be temporally confined, she embraces a wide range of historical periods; some of her most ancient stones find their roots in the early 18th century. When it comes to trends, and suggestions from others, Lydia Courteille does not let them limit her artistic vision. In fact, she happily avoids them. For her, only the sky is the limit. The collections are exclusively available at Lane Crawford ifc mall and Lane Crawford Canton Road. Every one knows I love fashion (well, you know it from the company which I am working for now! hoho), but what you don’t know is I LOVE drawing too! For someone like me, nothing tops when fashion meets drawing! Now Lane Crawford’s Spring/Summer 2013 Campaign interactive game, which I am so addicted to recently, gives me chances to show my art talent and passion to fashion! Simply a few strokes with your mouse you can create your very own Lane Crawford campaign in your style. I just can’t help but keep drawing! Here is one of my works! This fun game just makes us so addicted that Seline just can’t stop playing too! Want to create your own Lane Crawford campaign like us? Visit lanecrawford.com to get started! Creative Director of Shamballa Jewels will be in town! Never before had fine jewellery been presented with such refined casualness or offered such a high level of customization. Shamballa Jewels are custom hand-made by Mads and his brother Mikkel Kornerup from the most exclusive materials like gold, diamonds and precious stones, and are worn by some of the most popular designers and celebrities such as Karl Lagerfeld, Carine Roitfeld, Diane Von Furstenberg, Giorgio Armani, Gwyneth Paltrow, Jay Z and many more. Good news to all Shamballa Jewels fans! Lane Crawford is excited to launch the Shamballa Jewels Trunk Show from February 28 to March 10 at Lane Crawford ifc Mall and from March 13 to 24 at Lane Crawford Canton Road. The Creative Director of Shamballa Jewels - Mads Kornerup will be in town for interview on March 6 to present the special collaboration with Lane Crawford and share his philosophy of Shamballa. To encourage and introduce new ways of wearing jadeite which people used to think of it as old-fashioned item, Lane Crawford invited Shamballa Jewels to specially design 3 exclusive bracelets with our picked jadeite beads along with their signature Shamballa Bracelet design. Apart from the 3 exclusive pieces, the trunk show will showcase up to 150 masterpieces ranging from HK$60,000 to HK$22,000,000. For high resolution images, more information or interview arrangement, please contact the PR team. Spring/Summer 2013 Womenswear and Menswear samples are ready for loan! Good things are worth waiting, we are thrilled to let you know the Spring/Summer 2013 Womenswear and Menswear Samples are now available for loan! 3.1 Phillip Lim, Alice + Olivia, Elizabeth and James, Haider Ackermann, Helmut Lang, J Brand, Joseph, Markus Lupfer, Stella McCartney, Theory, The Laundry Room, Wilfox. For further information, press loan request, instore shoot request, please contact the PR team. Holidays are finally over, doesn't mean there is no more reasons to go shopping. To kick off the season, we have prepared a wide range of new arrivals from Womenswear, Menswear, Lingerie, Home and Lifestyle, Jewellery and Cosmetics. Be sure to clear out your wardrobe, jewllery box, cosmetic bag or even throw away old furnitures before visiting our stores! Please contact the PR team for further information. Showcasing exciting stories and exhibitions, and collaborating with inspiring creatives and designers each season to create works of art is always our aspiration. This season Lane Crawford collaborates with 3 artists tying in with the Spring/Summer 2013 campaign. Last week we have talked about Mosaic Art Project, so today we are introducing to you the other two multi-talented artists - Kim Tang and Stickyline. Awarded “The Most Promising Young Talent” by Lane Crawford in 2007, Kim Tang has continued to fulfil his as a fashion artist and designer over the past few years and this season Tang has collaborated with Lane Crawford once again to create a unique installation. In order to replicate the jagged angles of our campaign, artist Kim Tang created this installation utilizing dozens of acrylic fragments. Evoking dark sensibilities, Tang’s artwork juxtaposes fine craftsmanship with a jagged aesthetic to capture the mood and movement of the campaign. Founded in 2011 by Mic Leong and Soilworm Lai, Stickyline plies their trade transforming two-dimensional planes into three-dimensional forms. Stickyline has created this geometric installation from dozens of cardboard shapes for Lane Crawford’s Spring/Summer 2013 Campaign. The work mimics the dynamic lines of our campaign and captures the energy and explosive nature of this season’s imagery through eco-friendly and practical means. While shopping the new season must-haves at Lane Crawford stores, don't miss the aesthetically pleasing visual merchandises and window displays for the amazing artists! For high-res images, feel free to download here: https://lanecrawford.box.com/s/omh1nxt4mbef0sqf4t1b, or contact the PR team for more information.